Ben and I went on a long road trip up to Toronto/Ottawa and Boston to see my friends and family for Labor Day weekend. Several of my friends in Toronto had given birth or are currently pregnant, so I wanted to see them. The trip was an ambitious one. Originally I planned on spending the weekend in Toronto, but my mother was in Boston to help my sister take care of her baby. My mother wanted us to come up to Boston. So in order to see my friends in Toronto and my family in Boston, we had to do a lot of driving. Friday: Drove to Toronto (took about 10 hours). Had dinner with several of my friends (one was pregnant) in an up and coming neighborhood, Ossington. It was great seeing my friends. I miss them. Saturday: We had coffee with a friend who recently gave birth. I cooed over her baby. Then we had brunch with another friend and her husband. Then we had a 5-hour drive to Ottawa to another friend’s place (we stopped to buy apples pies at The Big Apple in Colbourne. The pies are really good. I really recommend that you stop and get one if you drive by. You can’t miss it. There’s a giant apple right next to the freeway. The pies are huge and cheap – $12. There are several different kinds of apple pies that you can get. My favorite is Mumble Crumble where there’s crumble topping for the top crust.). We spent the night with him and his family. We played with his two young daughters. Sunday: Drove 8.5 hours to Boston to see my family. Had lunch at The Mad Taco in Montpelier, VT. The food was really good. I loved my slow-cooked pork tacos. The best part of The Mad Taco were all the different homemade hot sauces. 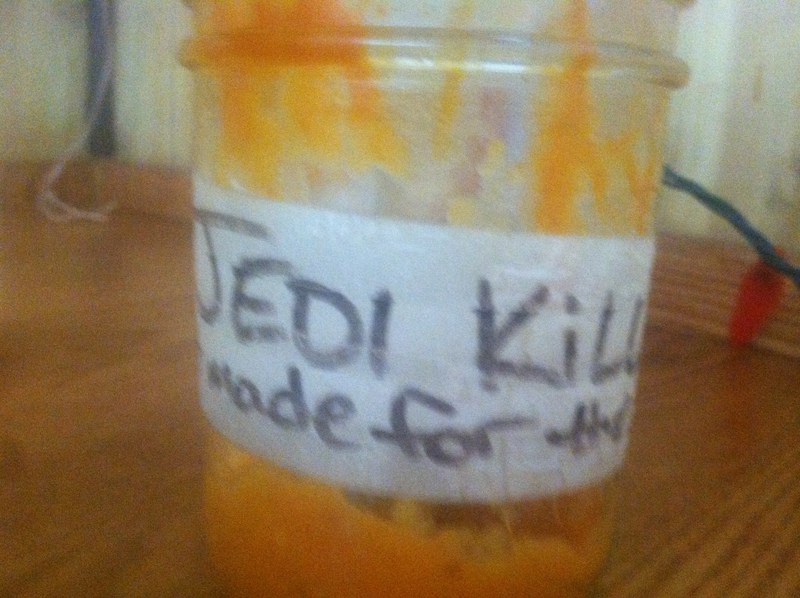 The hottest hot sauce they make is called Jedi Killer (not made for the meek). Although Mad Taco has picture of the Mad Hatter from Alice in Wonderland, they love Star Wars and Lord of the Rings. 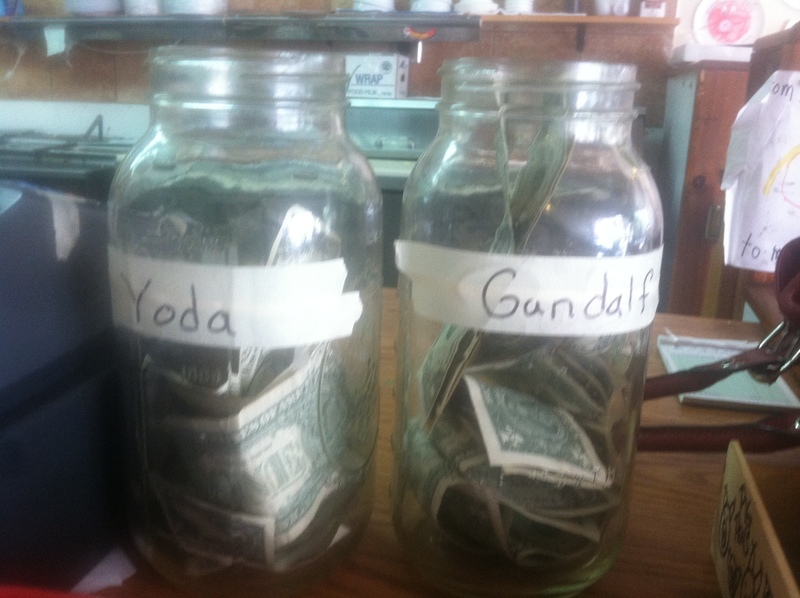 You decide whether you want to leave a tip for Yoda or Gandalf. 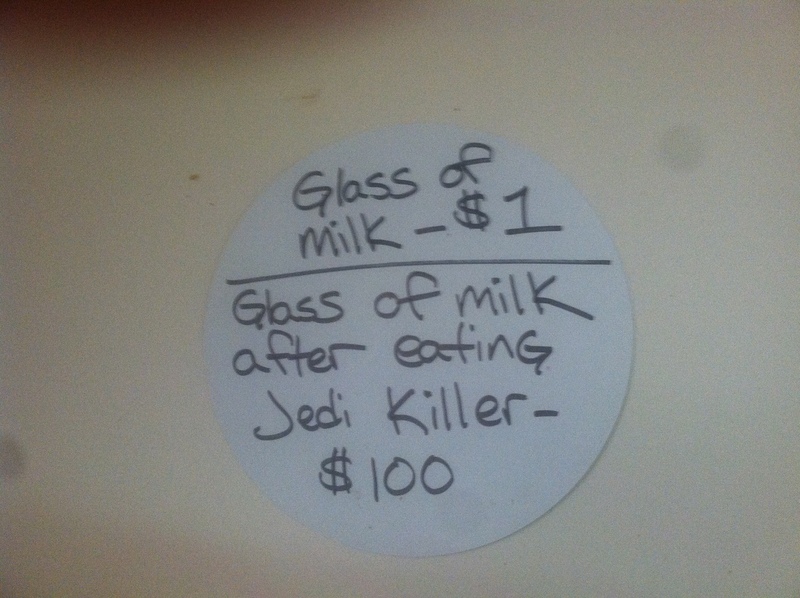 I tipped Yoda. Finally we drove to Boston and stayed at my sister’s home. Monday: Got entertained by my mother trying to play Wii. She ran over several pedestrians and destroyed a car during a game. I marveled over the changes in my little nephew. He’s now capable of sitting up with assistance, can stay awake for an hour, and likes to chew on his fingers. He’s one happy and jolly little kid. Barely cried the entire time we were there. Tuesday: Went for a quick run before we drove 5 hours back to New York City. Much kudos to Ben for dealing with the long car rides. The poor guy does not like being in cars and he endured several hours for me. We barely ran over the weekend because of our packed schedule. We did a quick speed work on Friday before we hopped into the car (the building’s gym is down the hall from where our unit is, so it’s easy to get a quick run in). I wanted to run a fast mile, but I wasn’t feeling it. I had to stop after .6 miles at 9 mph. My sister lives a couple blocks away from Francis William Bird Park, so I thought it would be fun to get another quick run in before we sat in a car for several hours. Francis William Bird Park is about 89 acres with 3 miles of trails and walking pathways. On the map and reading 89 acres makes the park sound bigger than it actually is. It’s called Bird Park because Bird is Francis William’s last name. It isn’t actually a bird watching place, which is what I originally thought. It’s a pretty nice park for walking and bringing small children. There’s a nice playground for them. 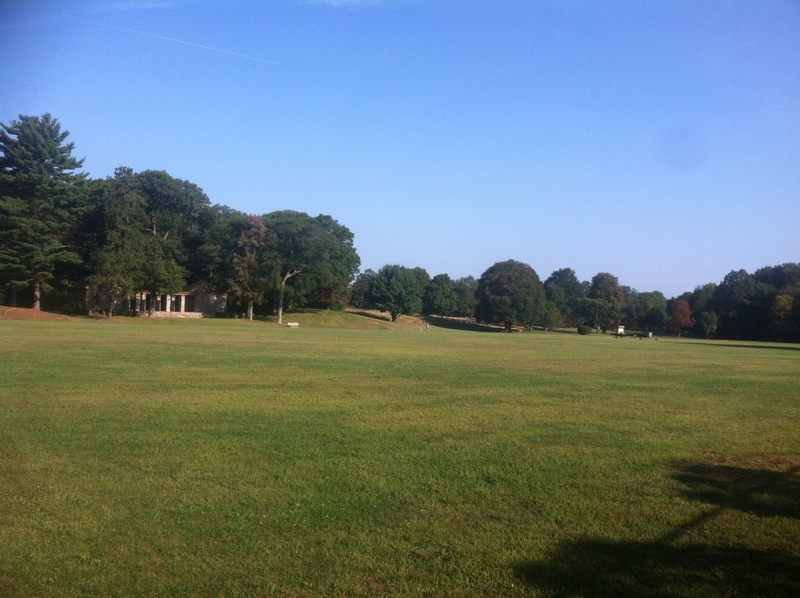 As for running, the park is fine if you just want to do a short easy run. Ben and I ran on all the different paths and walkways to “explore” the park. Our favorite section of the park was the more rural looking part where the path was a trail and we got to run over small footbridges. We ran three “easy” miles at a 8:45 pace, which felt harder than that because it was so humid. After breakfast we left for home. We came back home in the afternoon. I got some work done at home, which freed me up to go running with our running club in the evening. Lately the group has been doing longer 5-mile runs instead of the usual 3-mile runs. On Tuesday a larger than usual group showed up, which was fun. Ben ran with the faster runners and I trailed behind for about three miles. After that I lost sight of them. I ran that particular route before, so I knew which way to go most of the time. I forgot how to get to the pub where we were all meeting at for drinks and food when I was about a half mile away. Eventually I figured it out. Even though I wasn’t the slowest runner, I was the last one to show up because I got lost. Luckily I arrived just before Ben was thinking about heading back to the park to look for me. The 5-mile run felt great. Unfortunately Runtastic didn’t record the exact distance, so I don’t know the exact pace, but I ran somewhere between 8:35 and 8:45 pace. Before leaving on the trip, I had a number of not-so-great runs (not completely terrible, but not good either). The speed workouts felt awful and in some ways I thought I was regressing because I couldn’t quite complete what I used to be able to do. Even though I didn’t intend to take so many days off and I do take two rest days per week, I think I really needed extra rest days. My legs felt fresh and really good and I was looking forward to running again. This morning I did another speed work on the treadmill. I didn’t quite get up to running two miles at 8.6 mph, I did only 1.8, but for the first time 2 miles felt doable. I had to quit a bit early because I suddenly got some acid reflux, but I quit feeling that I could have made 2 miles. The last few times where I tried to run 2 miles, I felt really tired and stopped feeling that it was still beyond my abilities. While it’s clear to us that I won’t be able to make the 1:49 goal for the Wineglass HM, we both think that the 1:50 is within my grasp. That’s an epic road trip! It’s so hard to squeeze in runs when you’re traveling like that. But sounds like your legs got some rest. I think you’ve def got 1:50 in you. The race is coming up so soon! Thanks, Karla. I had a good training run yesterday, so I’m feeling good. The road trip was crazy, but I’m glad I did it. I wanted to see my friends again after not seeing them for such a long time.